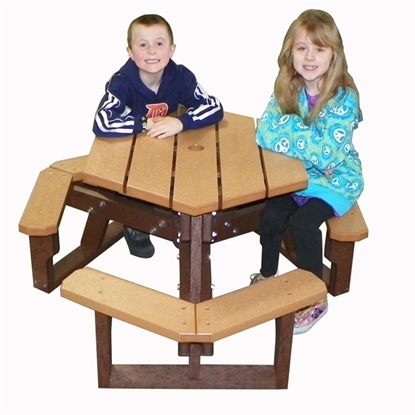 Shop Picnic tables for kids. Children picnic tables are safe at school and playgrounds! View our large selection of Children's picnic tables on sale today! Children's Rectangle Picnic Table 4 Foot Recycled Plastic, Portable, 72 lbs. Kid's Recycled Plastic Round Activity Table, 70 lbs. 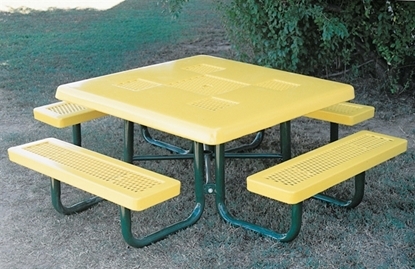 Child's Rectangle Picnic Table 8 Foot Plastic Coated Expanded Metal with Powder Coated 2 3/8 inch Steel Tube, Portable / Surface Mount, 280 lbs. Children's Rectangular 6 Foot Thermoplastic Steel Picnic Table, Regal Style, 217 lbs. Child's Round Picnic Table 46 Inch Plastic Coated Expanded Metal with Powder Coated Steel Tube, Portable / Surface Mount, 255 lbs. Child's Square Picnic Table 46 Inch Thermoplastic Coated Perforated with Powder Coated Steel Tube, Portable / Surface Mount, 310 lbs. Child's Round Picnic Table 46 Inch Plastic Coated Perforated Metal with Powder Coated Steel Tube, Portable / Surface Mount, 300 LBS. Child's Semi-Solid Square Picnic Table Attached Seats Plastic Coated Expanded Metal with Welded 2" Galvanized Steel, Portable, 269 lbs. 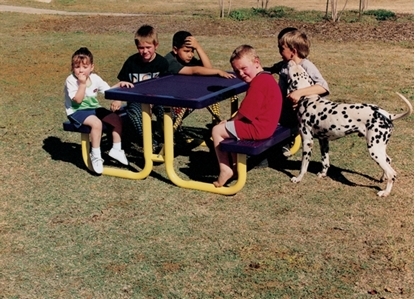 Park Tables sells all combinations of table sizes for your children. Our selection is complete with recycled plastic, plastic coated and our newest addition, vinyl plastic picnic tables. Prices are the best for schools with a budget as we are members of NSSEA to give you the most value for your budget. Our plastic coated picnic tables are great for resistance to vandalism. Park Tables children outdoor furniture takes care of the Kids!